The Dwight K. Shellman Jr. Caddo Lake Ramsar Wetlands Visitor Center has educational posters and materials that focus on wetlands, their roles and value, the Caddo Lake Ramsar site, and some if its flora and fauna. The wetlands at Caddo Lake were designated “Wetlands of International Importance” under the Ramsar Convention. The Caddo Lake Clearinghouse*, of which Caddo Lake Institute (CLI) is a member, opened the Wetlands Center on September 26, 2009 in conjunction with the opening of the National Wildilfe Refuge. The historic guardhouse from the Longhorn Army Ammunition plant (now the site of the Refuge) was moved and refurbished for the purpose. The Wetlands Visitor Center and Refuge are located at 15600 Highway 134 in Karnack, Texas. The Refuge is open daily from dawn to dusk. More information about the Refuge is available through Friends of the Caddo Lake National Wildlife Refuge at www.caddofriends.org or call the Refuge at 903/679-9144. See photos from the opening event here. See before and after photos of the guardhouse prepared by Nancy Canson here. See pdfs of the educational posters created for the Center by clicking on the poster name below. The Wetlands Visitor Center was made possible through many contributions. Funding was provided by the U.S. Fish and Wildlife Service, the City of Marshall, the Marshall Convention and Visitors Bureau, Jerry and Judy Cargill, the City of Uncertain, Don Henley, and theCaddo Lake Institute. There were also many people volunteered their time and services for the renovation and for the educational displays including Paul and Carol Fortune, Diane Jones and Mary Sanger. A special thanks is due to both Jack and Nancy Canson for on-the-ground management of the guardhouse renovation and coordination for the educational displays. Their work was indispensable in getting the Ramsar Center opened. Thanks also go to Terry Coleman, Stephen Werneke and Rudy Ruiz for their construction services in the guardhouse renovation. 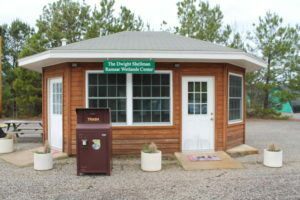 Finally, the Wetlands Visitor Center, and the Refuge itself, are a reality because of the hard work of Dwight K. Shellman Jr., who was President of the Caddo Lake Institute from 1993-2005. *Clearinghouse members include The City of Uncertain, the Greater Caddo Lake Association of Texas, The Caddo Lake Area Chamber of Commerce and Tourism, Friends of the Caddo Lake National Wildlife Refuge, and Caddo Lake Institute.